Freelance income, particularly within Rob’s field, is very difficult to predict. Our lean weeks far outnumber our “fat” ones, and while we have enough socked away in savings to continue our travels for quite awhile on zero income, we’re not comfortable with the idea of running the accounts down. We feel far more at ease keeping that money in savings, settling down somewhere for awhile, and saving towards other goals (e.g. early retirement, longer cruises, preparing the teenagers for jobs and/or college). What we have learned is that we don’t need the typical trappings of so-called “stability” to keep ourselves afloat, and we’ll be more likely to take calculated risks that might bring us joy in the long run. (For instance, Rob applied for a job sweeping floors — at NASA. NASA, people.) We have a much better sense of how much we need — and don’t need — for day-to-day life. Being a working mom means that I can’t do it all. Or, at the very least, it means that I can do many things halfway. I’m incredibly grateful that I’ve been able to pick up the accidental career of freelance writing for the last year, and it feels good to know that I can support the family if needed. What I’m not so good at is working…and homeschooling…and running a household…and travel planning. Stuff falls by the wayside, and more often than not it seems to be in the “attention to the kids’ education” department. Those are probably the three biggest factors in our looking to shift out of nomad mode and back into something a little more traditional — and yes, it’s bittersweet. 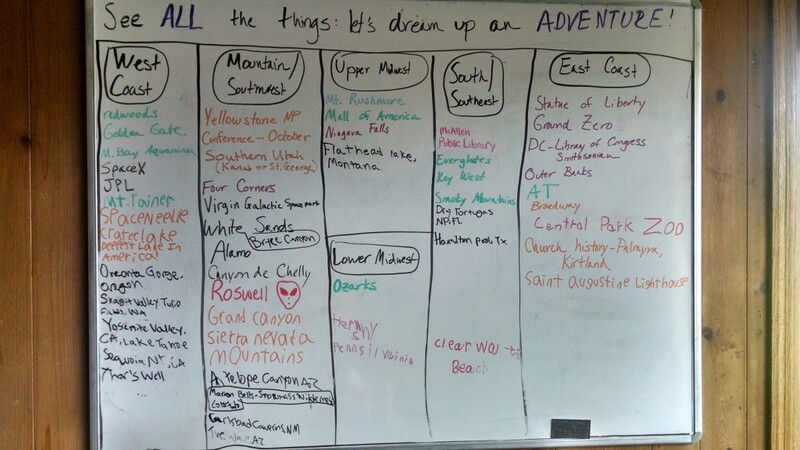 But again, when I look at our dry erase board bucket list from a year ago and then scroll through the pictures here on the blog, it’s easy to remember to be grateful for what is instead of feeling guilty for what isn’t. It’s been an AMAZING experience to see 17 different states (soon to be 21 as we travel from TX to FL for our next, and possibly last, VRBO home), to live in such a variety of communities and be welcomed there, and to check off my lifelong bucket list of a massive road trip with my family. Whatever happens next for the Worldwide Watsons, I doubt we’ll ever lose our spirit of adventure, our desire to See All the Things, or the memories we’ve created together as we’ve wandered the country. What a gift it’s been!